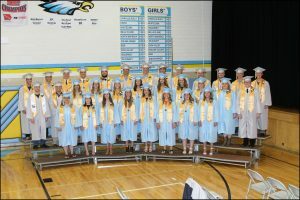 Thirty-two members of Lynnville-Sully’s Class of 2017 walked into the high school gym on Saturday, May 20, as seniors awaiting one of the biggest moments of their young lives. They walked out as proud L-S alumni, ready to take on the next chapter of their promising futures. Commencement exercises started with the L-S High School band providing the prelude, under the direction of Mr. Ryan McNulty, band instructor. 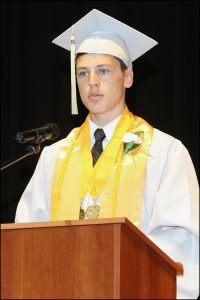 Following the processional, L-S Superintendent Shane Ehresman welcomed the crowd. The L-S Citizen of the Year Award was then presented by Tim Dunsbergen, school board president. This year’s recipients, Terry and Linda Lowry of Searsboro, are strong supporters of Lynnville-Sully academics and athletics. Lynnville-Sully Class of 2017: Front, Ricky Farris, Haley James, Alexis Hardenbrook, Makenzy Rozendaal, Jelissa Rozendaal, Kaylee Van Maanen, Allison Renaud, Kristine Jaennette; middle, Bryson Barnett, Colton Arment, Mikayla Smith, Isabella Bogaard, Libbie Vos, Jessica Drafahl, Olivia Ritter, Brenna Lanser, Katlyne Woodard, Chelsea Alter, Zach Van Waardhuizen; back, Lucas Jones, Caden Dunsbergen, Jim Trettin, John Trettin, Isaac Collins, Brandon Van Wyk, Ryan Hofer, Quentin Thompson, Tyler Van Zante, Brett Vanden Hoek, Trevor Squires, Dylan Roozeboom, and Derik Allbee. Scholastic medallions were given to graduates by Mr. Shane Wheeler, 7-12 dean of students and technology director, followed by the presentation of honor graduates by Ehresman. Valedictorians Jessica Drafahl and James Trettin and salutatorian John Trettin reflected back on their time at L-S, giving meaningful speeches that ended with motivational advice to their peers. Senior chorus members joined the high school chorus one last time to sing “Irish Blessing,” under the direction of Ms. Lexus Waymire, music teacher, and accompanied by Louise Redding. Finally, the big moment arrived when the Lynnville-Sully graduating class was announced and given their diplomas. Parents of graduates stood and felt the rush of years of memories flood back as their child walked across the stage to receive a diploma. Hugs, tears, and heartfelt well wishes were given as seniors embraced their parents with diploma in hand. The band provided the recessional as graduates were ushered out of the building for the congratulatory line held outside the school. More hugs and congratulations were shared as proud family and friends greeted each graduate. Thank you all for coming, and welcome to the graduation ceremony of the Class of 2017. Without any of you sitting in this crowd, I don’t think any of us would have made it here. I’d like to thank the administration and teachers for making sure we got here. I’d like to thank the community for always coming to our events, whether that was a sporting event, art show, concert, or play. I’d like to thank our parents for giving us the support we needed to get through everything in our lives. Finally, I’d like to thank my fellow classmates. Without this class, I would not have had the same experience that I had. Allow me to relive some of our favorite memories as a class. One of my favorite memories, and I’m sure most of us remember this, was a thing called “nap time” and “recess.” Another thing I remember is when our biggest worry in life was what we were doing that weekend. I think that some of us girls will remember in fifth grade when we split Civil War style over a snow fort. Yes, we had to skip recess and talk it out one day. And maybe you might remember the intense games of four- and six-square, which were taken away from us. Although, we always did find a way to get around the rules. Or maybe you remember how weird it was to transition into middle school, where we had so many different classes, and suddenly, we were on top of the world. And when you had to make sure you didn’t have too many AMTs and you made your AR goal, because you really wanted to go to Adventureland at the end of the year. Another middle school memory might be the first big trip we took as a class, when we were able to go to D.C.
More recently, I remember when we were freshmen, and we were so offended that the seniors kept calling us “stupid freshmen.” Sorry, Class of 2021, but it’s going to happen to you. I’m also sorry for the seniors that are going to college, because this fall, we’re going to be stupid freshmen all over again. Then I remember junior year, when we couldn’t wait until we were seniors. Until it happened, that is, and then it didn’t seem that special anymore. There were also the trips that we took. Music and drama kids were able to go to Nashville and New Orleans, math and science students were able to go to Saint Louis and Chicago, and then our last hoorah was when we went to Kansas City. And finally, our last memory as a class is right now, at this moment. Congratulations, Class of 2017, you made it to graduation. Make sure you look around you and make sure you talk to your fellow graduates, because tonight might be the last night you ever see these people again. Thank you to the high school staff, parents, and Class of 2017. Tonight, I want to offer the Class of 2017 a look into the past and into the future. As a forenote, this is a speech directed to the Class of 2017, my class, so I apologize to staff and parents for the inside jokes. First, I’d like to give a short list of accomplishments of the Class of 2017. In the span of our four years, we saw Mrs. Rowe through four or five surgeries and countless trips to the emergency room. We fully funded a senior trip on money from Kickstart cans. We even drove Mr. Beyer to retirement! But on top of this, we learned in high school. Yes, I know it may seem surprising. With Mrs. Van Wyk, we learned how to spend our money wisely, or at least for a month. Some of us got through four years of Spanish without hardly learning any of it, while others spent two hours each night on homework. As freshmen, we learned how to avoid seniors, and as seniors, we’ve learned how to avoid freshmen. Now, I have a question for the class. Where are we going? Will Rogers once said, “Even if you're on the right track, you'll get run over if you just sit there.” And this is true for our class. Perhaps amidst the endless presentations and speeches with Ms. Hardin, you may have asked yourself, “Why did I take speech and drama?” Maybe during a six-mile run on the airport or conditioning with Coach Parkinson, you couldn’t help but think, “What was I thinking getting myself into this?” Personally, I’ve gotten this feeling a lot in high school. While in France, sometimes after waking up, I would sit up, squint my eyes, scratch my head, and seriously contemplate all of my decisions that had led me to that moment. We’ve all experienced this sense of misdirection. Of course, always remember where we come from, but more importantly, never forget where you are going. It’s okay to modify your path or track, but it is never okay to sit down at a crossroads. I heard there were going to be a couple more speeches tonight – something about a tie? So, I’m going to make this as quick as possible so that we can all watch some burnouts. I’d like to start off by thanking all the community members, faculty, friends, and family who made this possible. Let’s give a big round of applause to Mr. Dwight Beyer who is retiring this spring after 38 years at Lynnville-Sully. Because this is a speech about graduating high school, naturally, I wrote it at the last minute. When thinking about my high school career at L-S, memories from elementary and junior high also come to mind. I think of how my best friend in one year turned into a bitter rival the next because we were put into different classes, or how the tangle of alliances in four-square made it more competitive and dramatic than you would’ve ever imagined. Looking back on it, I don’t know how junior high teachers put up with kids asking, “When am I going to use this in real life?” every single lesson. When thinking of high school, each year is marked by the computer game that was most popular each year. Freshman year had 8 Ball Pool, sophomore year had Tanki, junior year had Agar.io, and senior year had Bonk. While some might credit Google, Yahoo, and Wikipedia for their high school success, I have James to thank. But graduation is also a time to look forward. I’d like to quote one of the great philosophers of our time – Donald J. Trump – when he said, “I like to think big. If you’re thinking anyway, you might as well think big.” All jokes aside, he has a point. You shouldn’t just set goals for yourself, you should set high goals. You shouldn’t do the bare minimum, you should push yourself to your limit. If you have initiative and hard work, the fate of your goals and dreams are in your hands.